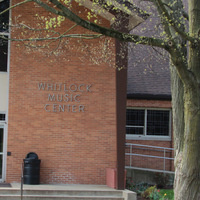 Acquired in 2005, the old Greenville Free Methodist Church building is now Greenville College's Whitlock Music Center. The College has converted the 38,000 sq. ft. space into a new home for the Music Department that includes classrooms, practice rooms, recording studios, and space for lab bands. The former sanctuary has been converted into the James E. Wilson Recital Hall and is where students gather for chapel and Vespers. "I don't mind if you go to strip clubs with the boys." Eh. Some of us don't appreciate our guys ogling other women, some of us are feminists, but no matter what, most people try to say we're insecure. Why fight it? I loved Professor Jeff Barker's retelling --in Creole!-- of the Last Supper, complete with actors forming scenes.